You are currently browsing the The Pet Product Guru blog archives for the day Saturday, November 17th, 2018. The Comfort That Our Best Friends Give is Enormous! Owning a dog or a cat has many emotional benefits for their owners. not only are they known to lower blood pressure and provide unconditional love all the time, they are known to give us comfort in the time of grief. 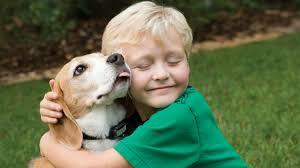 National Geographic has published an article about dogs comforting some of the victims of the Sandy Hook Shootings. One boy confided in the gentle-faced golden retriever about exactly what happened in his classroom at Sandy Hook Elementary School that day—which his parents said was more than he’d been able to share with them. A little girl who hadn’t spoken since the shootings finally started talking to her mother again after petting one of the “comfort dogs.” Groups of teenagers began to open up and discuss their fear and grief with each other as they sat on the floor together, all stroking the same animal. The dogs are therapy dogs—professional comforters that were brought to Newtown, Connecticut, almost immediately after the horrific shootings on December 14 that left 20 young children and 6 staff members dead. The positive affect of dogs clearly shines in this article! It’s a 60s and 70s weekend on EDGEWATER GOLD RADIO! All 60s and 70s, all weekend long. Ask Alexa to “play Edgewater Gold Radio.” Download the free Edgewater Gold Radio app from our app store or listen from our website: Edgewatergoldradio.com. add comment Comments Off on The Comfort That Our Best Friends Give is Enormous!